I’ve always been a fan of just plain cranberry sauce. I even liked the store bought sauce as a kid. I’m sure you can remember the tube of the stuff that would slide out of the can onto a serving plate. That was until I discovered homemade, and I never looked back. I’ve made it many different ways, but just plain cranberry sauce is still one of my all-time favorites. 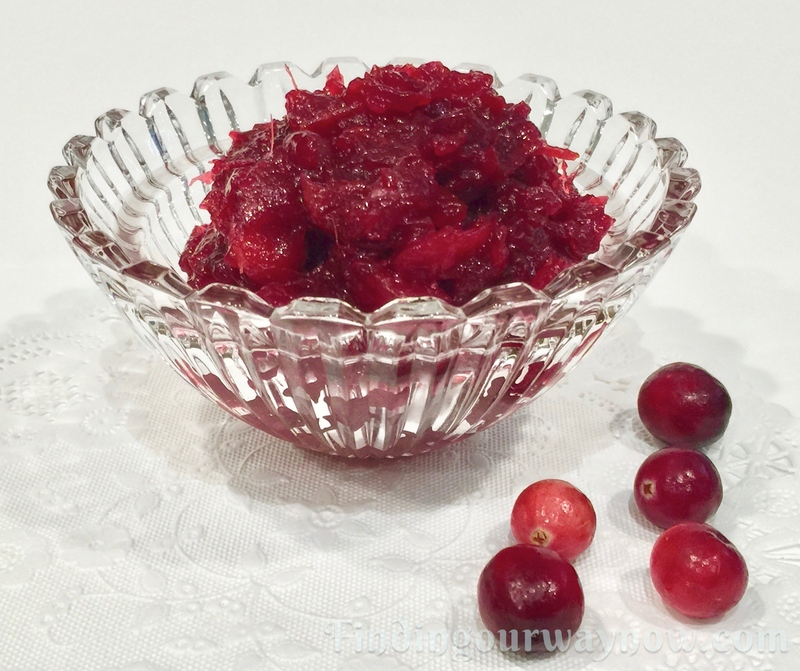 Let me show you my version of just plain cranberry sauce recipe. Ingredients: Makes approximately 5 to 6 half-pint jars. Clean and sterilize canning jars, bands and lids and set aside. Wash the cranberries, discarding any debris or bad berries. Place the sugar, fresh orange and lemon juice in a large saucepan and cook on low until the sugar has dissolved. Reserve ¼ cup of the orange sugar mixture and 1½ cups of fresh cranberries and set aside. Add the remaining cranberries, orange, and lemon zest to the dissolved sugar mixture, stir to combine and cook over medium heat for about 10 to 12 minutes, until the cranberries are softened, and the mixture starts to thicken. Add the remaining reserved cranberries, orange juice, and salt and continue to cook about 10 minutes or until the newly added cranberries have burst. Using a canning funnel pour the cranberry sauce into the canning jars, label, cap, and seal. Allow the jars to cool to room temperature. Serve immediately or refrigerate up to three weeks. The just plain cranberry sauce may be frozen for up to a year. Notes: This recipe can be a bit thick. If you prefer it more on the saucy side, add a bit of water to the recipe when you add the reserved cranberries and reduce it to the consistency you prefer. If you can’t find fresh cranberries, frozen will do just fine. 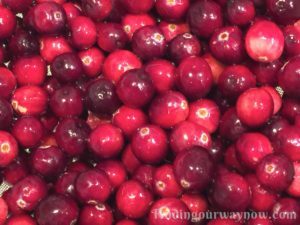 A note on frozen cranberries – when they’re in season, I’ll buy a few bags of fresh cranberries and freeze them for any time I might need them in sauces or recipes. This recipe can be halved, doubled or tripled; the quantity you make is up to you. If you prefer not using the orange and lemon juice, use water in their place. I like using the two juices because they add a very nice background note to the cranberry sauce. If it’s not quite sweet enough for your taste, while the sauce is still hot, add a bit of sugar a little at a time to your liking. Be careful not to over do it. Just Plain Cranberry Sauce is full of flavor, and it’s just that simple. The writing of this recipe has taken me longer to describe how to make it than it took to cook it. It can be spread on biscuits, poured over baked brie, goat cheese, cheesecake or all manner of things you think would be fun. 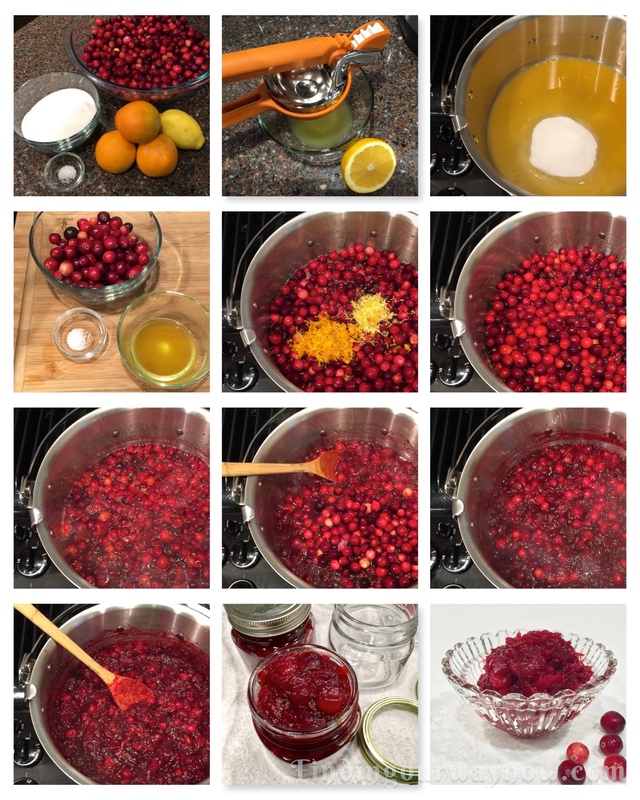 I like this just plain cranberry sauce so much that I’ll can a few batches for the many times I’d like to add it to a festive meal throughout the year. A jar or two make for a great hostess gift around the holidays.